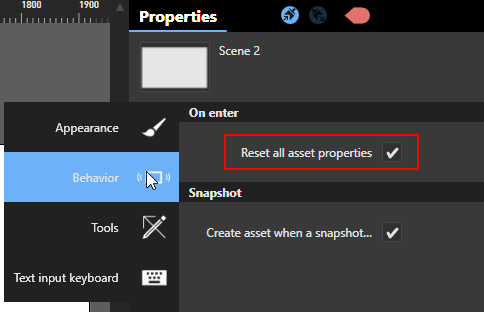 Select the Scene in which asset properties must be reset. Every time a user leaves and re-enters this scene or this scene's Reload action is called, all assets will be reset with their original property settings. NOTE: Interface assets are unaffected by the "Reset all asset properties" option. To reset any aspect of a particular interface asset (IA), you must explicitly call a reset action - if one exists - associated with that IA.